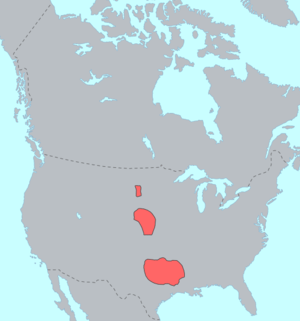 The Caddoan languages are a family of Native American languages. They are spoken by Native Americans in parts of the Great Plains of the central United States, from North Dakota south to Oklahoma. The Kitsai language is now extinct, as its members were absorbed in the 19th century into the Wichita tribe. All of the other Caddoan languages are critically endangered; Caddo is now spoken by only 25 people, Pawnee by 20, and Arikara by three. The last native speaker of Wichita, Doris McLemore (who left recordings and language materials), died in 2016. Caddo and Pawnee are spoken in Oklahoma by small numbers of tribal elders. Arikara is spoken on the Fort Berthold Reservation in North Dakota. Glottochronology is a controversial method of reconstructing in broad detail the history of a language and its relationships. In the case of proto-Caddoan it appears that it divided into two branches, Northern and Southern, more than 3,000 years ago. (The division of the language implies also a geographic or political separation.) South Caddoan or Caddo proper evolved in north-eastern Texas and adjacent Oklahoma, Arkansas, and Louisiana. Other than Caddo, no daughter languages are known, although some probably existed in the 16th and 17th century but were not recorded. Northern Caddoan evolved into several different languages. The language that became Wichita (with several different dialects) branched off about 2,000 years ago. Kitsai separated from the Northern Caddoan stem about 12 centuries ago and Pawnee and Arikara separated 300 to 500 years ago. Adai, a language isolate known only from a 275-word list collected in 1804, may be a Caddoan language. The documentation is too scanty to determine with certainty. The Adai lived in Louisiana. The language of the Ais, who lived adjacent to the Caddo, was a distinct language, but was probably related to Caddoan. (Another unrelated people also called the Ais lived in Florida.) Some linguists believe that the Caddoan, Iroquoian, and Siouan languages may be connected in a Macro-Siouan language family, but work is suggestive and the theory remains hypothetical. Similar attempts to find a connection with the Algonquian languages have been inconclusive. There is insufficient evidence for linguists to propose a hypothetical Macro-Algonquian/Iroquoian language family. ↑ Hammarström, Harald; Forkel, Robert; Haspelmath, Martin; Bank, Sebastian, eds. (2016). "Caddoan". Glottolog 2.7. Jena: Max Planck Institute for the Science of Human History. Chafe, Wallace L. (1976). Siouan, Iroquoian, and Caddoan. In T. Sebeok (Ed. ), Native languages in the Americas (pp. 527–572). New York: Plenum. (Originally published as Chafe 1973). Chafe, Wallace L. (1993). Indian languages: Siouan–Caddoan. Encyclopedia of the North American colonies (Vol. 3). New York: C. Scribner's Sons ISBN 0-684-19611-5.